Bobby Rodriguez has made history. This is the first recording from one artist of all Christmas music in Latin rhythms. 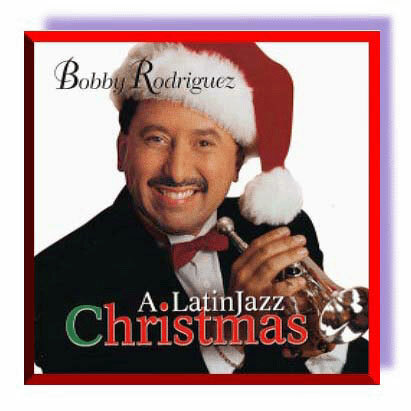 Bobby is a superb, high-energy trumpet player as well as a dynamic and charismatic leader, gifted composer and skilled arranger and on "A LatinJazz Christmas," he enhances the standard Christmas repertoire with his unique breed of LatinJazz. Playing with the fiery passion which distinguishes all of his work, Rodriguez and his seven piece band present the Christmas classics in a variety of hot rhythmic setting including Salsa, Cha-Cha, Samba, Bolero and 6/8! "A LatinJazz Christmas" is perfect for spinning mother or grandmother around the living room. "Feliz Navidad", Santa Claus Is Coming To Town" and "Silver Bells" are all tasty Cha-Cha's. "Have Yourself A Merry Little Christmas," "White Christmas" and "Oh Christmas Tree" all require your best "chanclas para bailar" (dancing shoes). When you need to catch your breath there are two gorgeous boleros, "The Christmas Song" and "Silent Night"...perfect by the light of the Christmas tree. Bobby takes "Jingle Bells" to Rio de Janeiro with an enjoyable samba, while Santo Domingo contributes to this Christmas effort with the merengue "Deck The Halls." "We Three Kings" provides reflective and haunting moments over a 6/8 rhythm. "Es La Navidad" and "It's Time For Christmas" are the same song with both a Spanish and English version in which Bobby humorously quips, "Mira Santa Claus que gordo esta" ("look at Santa Claus, how fat he is! ")delivered, of course, with respectful affection. Bobby Rodriguez has expanded the range of Christmas music. While completely fresh, A LatinJazz Christmas will find a permanent home next to Nat King Cole's, The Christmas Song and Johnny Mathis,' Merry Christmas. Like these classic recordings, A LatinJazz Christmas will help us all build many fond Christmas memories in years to come. Bobby say it best, "It's time for happy thoughts and a time to remind your family that you love them. It's a time to give." For future generations, Rodriguez leaves this message, "Go with your heart, it never lies." We are fortunate that Bobby Rodriguez followed his own heart, resulting in the creation of this historic recording. It is a powerful gift from him to us. Enjoy A LatinJazz Christmas. Feliz Navidad!